Originally a wharf rat from the East End of London, Simon left by sea in search of greater opportunity. Following years of riotous living east of Suez, he sneaked down the hawser from a rusty tramp freighter to the Seattle docks one dark night in 1994. Hearing of the abundant beer reserves beneath Fremont, Simon soon gravitated to that section of town, where he met up with the fun-lovin' crew from the Fremont Arts Council. It was from within these ranks he found others with a desire to light things on fire, singe eyebrows and blow each other up in an attempt to entertain people. 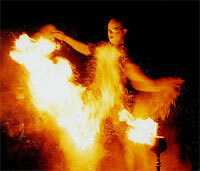 He has been featured in every show since, often as the character "Matches" and always exploring the playfulness of fire.